This research is performed using Arabidopsis (photorespiratory cycle), Flaveria (evolution of C4 photosynthesis), and selected cyanobacteria including Synechocystis (glycolate metabolism and salt stress responses). Plants produce oxygen as a waste product of photosynthesis, but they do not like it very much themselves. This is because oxygen triggers photorespiration, an ancient process inherited from the evolution of photosynthesis in bacteria that lived more than three billion years ago in the still oxygen-free Precambrian ocean. Photorespiration starts with the binding of oxygen to Rubisco, the same enzyme which is also responsible for the photosynthetic fixation of carbon dioxide. This directly inhibits carbon dioxide fixation. Moreover, oxygenation of the carbon dioxide acceptor molecule RubP produces phosphoglycolate and glycolate. These two compounds are potentially toxic and need to be converted into useful metabolites. 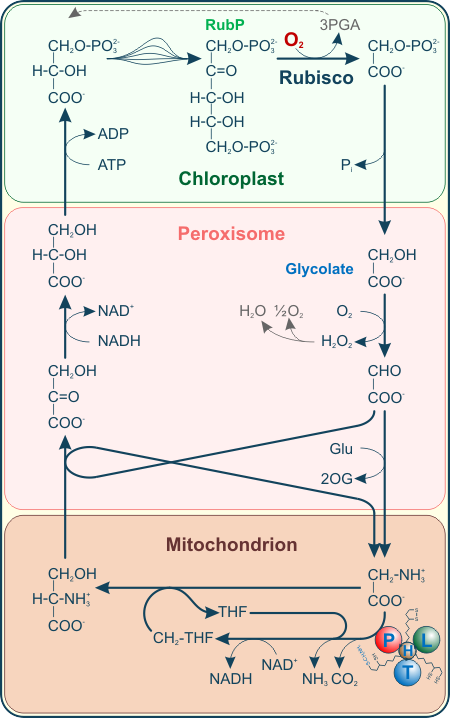 The conversion occurs in the photorespiratory cycle, one of the most important metabolic adaptations during the evolution of oxygen-evolving photosynthesis. In a sense, since oxygen is necessary for most heterotrophic life, the operation of the photorespiratory cycle was a prerequisite not only for the evolution of plants but also for the appearance of beast and man. First, we want to better understand the metabolic system that allows plants to thrive in an oxygen-containing atmosphere and how these processes are embedded into cellular metabolism. Second, we study how photorespiration and its enzyme components evolved over about three billion years from cyanobacteria, the first oxygen-producing organisms, to plants. The photorespiratory cycle is also related to the evolution of C4 plants. Such plants concentrate carbon dioxide by the so-called C4 cycle within specific cells of the leaf, the bundle-sheath. This reduces photorespiration and improves the water-use-efficiency. 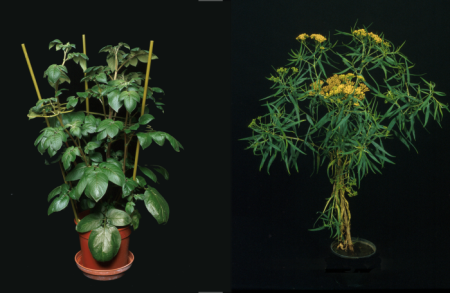 We want to understand how photorespiratory processes contributed to the evolution of C4 plants. We are also interested in the adaptation of plants to salty soils. To improve plant growth and harvests on such soils, we aim to identify and possibly transfer cyanobacterial salt tolerance systems to higher plants. 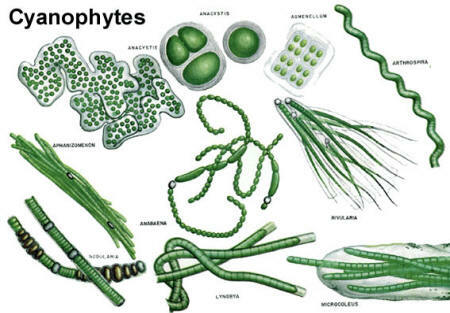 Cyanobacteria are the remote ancestors of chloroplasts. They have an evolutionary history of more than three billion years and are well adapted to a variety of very different including salty habitats. Our major target for transfer to plants is the biosynthetic system for glucosyl glycerol, a compatible solute that protects cyanobacteria from salt stress.